​Chris Etienne first joined Rotary in 1990 and has been a member of the Rotary Club of Petoskey since 1991. She served as club president in 1997-98. Chris has served Rotary District 6290 in many capacities including Assistant Governor, Membership Chair, District Trainer, Nominating Committee Chair, and Finance Chair. Chris served as District Governor in 2007-2008. She is currently District Rotary Foundation Chair and served on the Great Lakes Multi-District PETS Committee from 2003-2011. Chris was a trainer at the Zone 28-29 Institute in 2008, 2009 and 2010 and served as a Rotary Coordinator for Zone 29. She was assistant training coordinator for the Zone Institute in 2010 and was lead training coordinator for the Zone Institute in 2011 and 2012. She was chair of the Zone Institute in 2013. Chris served Rotary International as a training leader at the International Assembly in San Diego in 2009 and 2010 and has served as President's Representative each of the last four years. She also served on the Rotary International Membership Development and Retention Committee in 2011-12 and is served on the 2015 RI Convention Promotion Committee in Sao Paulo, Brazil. Chris is Director of Leasing for the Village at Bay Harbor as well as Community Relations Director for Bay Harbor, a resort development located on the shores of Lake Michigan. She is also Associate Broker for Harbor Sotheby's International Realty located in Bay Harbor. 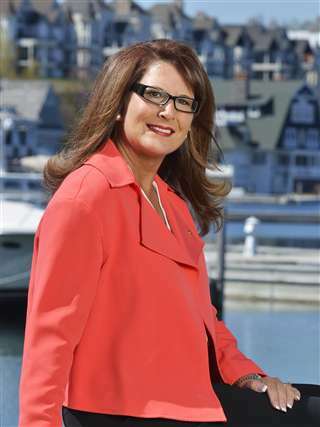 She has served her community as a board member and volunteer for several organizations including Petoskey Regional Chamber of Commerce, Petoskey Rotary Club Charities Inc., Bay Harbor Foundation, Hospice of Little Traverse Bay, Northwest Michigan Industrial Association and Women's Resource Center. Chris was appointed by Governor Rick Snyder in 2011 to serve on the Michigan Women's Commission and was appointed vice chair in 2012. Chris received the Athena Award in 2007 and the Emmet Association of Realtors Realtor of the Year award in 2014. ​Chris has been married to Dennis Lindeman since 1995. They are Major Donors of The Rotary Foundation and members of the Bequest Society. They participated in an NID for polio eradication in Uttar Pradesh, India in 2004. They have hosted eight Group Study Exchange Team members. Chris is also the recipient of The Rotary Foundation's Citation for Meritorious Service.